Stereochemistry, a subdiscipline of chemistry, involves the study of the relative spatial arrangement of atoms that form the structure of molecules and their manipulation. The study of stereochemistry focuses on stereoisomers, which by definition have the same molecular formula and sequence of bonded atoms (constitution), but differ in the three-dimensional orientations of their atoms in space. For this reason, it is also known as 3D chemistry—the prefix "stereo-" means "three-dimensionality". An important branch of stereochemistry is the study of chiral molecules. Stereochemistry spans the entire spectrum of organic, inorganic, biological, physical and especially supramolecular chemistry. Stereochemistry includes methods for determining and describing these relationships; the effect on the physical or biological properties these relationships impart upon the molecules in question, and the manner in which these relationships influence the reactivity of the molecules in question (dynamic stereochemistry). Cahn–Ingold–Prelog priority rules are part of a system for describing a molecule's stereochemistry. They rank the atoms around a stereocenter in a standard way, allowing the relative position of these atoms in the molecule to be described unambiguously. A Fischer projection is a simplified way to depict the stereochemistry around a stereocenter. An often cited example of the importance of stereochemistry relates to the thalidomide disaster. Thalidomide is a pharmaceutical drug, first prepared in 1957 in Germany, prescribed for treating morning sickness in pregnant women. The drug was discovered to be teratogenic, causing serious genetic damage to early embryonic growth and development, leading to limb deformation in babies. Some of the several proposed mechanisms of teratogenecity involve a different biological function for the (R)- and the (S)-thalidomide enantiomers. In the human body however, thalidomide undergoes racemization: even if only one of the two enantiomers is administered as a drug, the other enantiomer is produced as a result of metabolism. Accordingly, it is incorrect to state that one stereoisomer is safe while the other is teratogenic. Thalidomide is currently used for the treatment of other diseases, notably cancer and leprosy. Strict regulations and controls have been enabled to avoid its use by pregnant women and prevent developmental deformations. This disaster was a driving force behind requiring strict testing of drugs before making them available to the public. 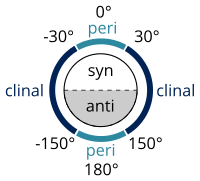 a torsion angle between ±150° to 180° is called antiperiplanar or anti or trans (ap). Torsional strain results from resistance to twisting about a bond. Skeletal formula#Stereochemistry which describes how stereochemistry is denoted in skeletal formulae. ^ "the definition of stereo-". Dictionary.com. Archived from the original on 2010-06-09. ^ Teo SK, Colburn WA, Tracewell WG, Kook KA, Stirling DI, Jaworsky MS, Scheffler MA, Thomas SD, Laskin OL (2004). "Clinical pharmacokinetics of thalidomide". Clin. Pharmacokinet. 43 (5): 311–327. doi:10.2165/00003088-200443050-00004. PMID 15080764. ^ Francl, Michelle (2010). "Urban legends of chemistry". Nature Chemistry. 2 (8): 600–601. Bibcode:2010NatCh...2..600F. doi:10.1038/nchem.750. PMID 20651711. Archived from the original on 2010-08-26. This page was last edited on 22 March 2019, at 22:06 (UTC).